On a whim I decided to give Being Flynn a shot, a movie I intended to watch for a while now and somehow never really felt the need for it. This hesitance was mostly because deep down I had this fear that Robert De Niro was going to disappoint. The once phenomenal actor does not really put out any more. And rarely goes beyond solid. It's a shame really. If I hadn't seen The Family, Last Vegas and Grudge Match I would have been surprised by his role in Being Flynn. And maybe it would have restored my faith in him as an actor that compels. But just as I said, I have seen his recent movies where De Niro repeats playing the same role with only a few differences here and there. To me that is just disappointing and it makes you wonder if he is enjoying his craft or not and if it isn't time for him to stop and do something else. In any case Robert De Niro does a little better only still not enough to impress. 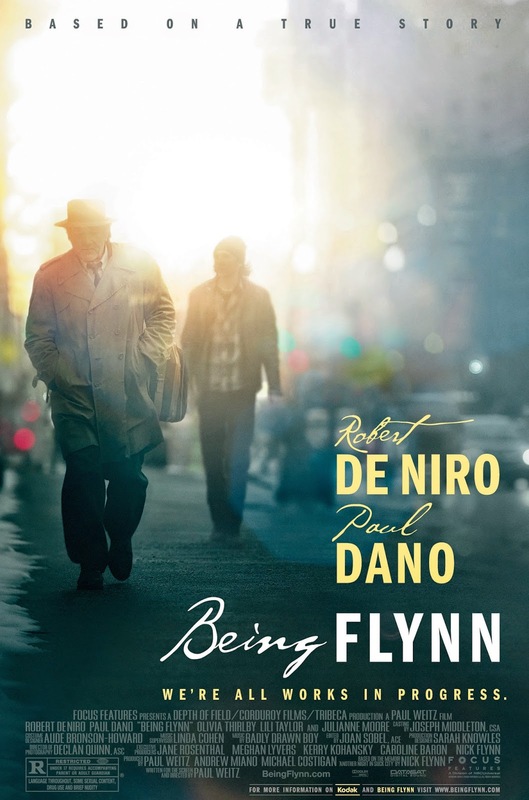 Being Flynn is not an easy film to watch as it deals with homelessness, addiction and psychological health. And that is fine with me as long as there is some point to it. There is a pretension about this film that views itself as some kind of eye opener otherwise how else would one explain some illogical events and the ending. Don't worry not going to spoil it but it was one where I was thinking I can't believe I just wasted an hour and forty minutes of my life. Will this be the conclusion for all viewers? I don't dare say. That depends on where you are in life and what you have experienced. Being Flynn desperately tries to tell you like all of it's subjects are original and new. And something the world should be informed about. Which is not bad as intentions go. But then it also tries to tell you that you can change things without actually showing how to or how hard it is to get back on your feet. Events here just happen without offering insight how the people get to achieve this or why they have achieved it. It's a little too convenient for my taste and a bit too easy. Furthermore deep within I can sense they are trying to tell a positive story only with an air of attitude and paternalism that rubbed me the wrong way. The world does not work like that. Sometimes you can have all the good intentions and still fail. The lesson that one actually has to learn from this however is how to deal with bad events and circumstances as much as the good ones since it is part of life and being aware can define you in a positive way. This is one of my own takes on life and thought I add this in for good measure as I only can imagine what the purpose of Being Flynn was. Instead I will tell you as I am sure a lot of other people what we were hoping and expecting of this little film. I think most wanted to see an endearing tale of a a father and son who have been estranged from each other and that for some reason would bond and it would make us feel good or at least made you feel it was worth your while. Being Flynn does not offer that at all. Instead it is more focused on Nick Flynn getting a grip on his life. Which to be honest pales in comparison to the promise. Maybe it was me but how his life supposedly was spun out of control did not come across the screen that well. Sure we get some hints thrown at us. So I do get that Paul Dano's character has good reasons to be in a bad place. Still seeing how easy it was for him to study, get work and find shelter after he lost it did make me wonder what exactly his struggle was about. His fear of being the same as his father a man he barely knows seems a bit far fetched to me. Maybe his fear was warranted but if it was they never really dig deep enough to show us why that was. Basically I am saying that Being Flynn is all promise and pretension that offers a decent viewing experience but also will anger you because you realize that you have been taken for a fool and been insulted as the film fails you to show the elements that matter, like the struggle and the emotions. In my opinion a waste of time.